On the path that runs from Dave and Nancy’s back porch to the Yal Ku Lagoon there is a small, unassuming acacia tree. I’ve brushed past it hundreds of times. It is a perfectly ordinary looking acacia tree—pleasant to look at, shades the trail nicely, lovely when it blooms—but man, you’d better be nice to it, because it is the most well-defended tree on the property. In fact, it is defended by an army. An army of ants. I love symbiotic relationships. If there’s anything that fills me with wonder more than organisms do, it’s the relationships between them. And this one will blow you away, I promise. The acacia is Vachellia collinsii, commonly called the hollow-thorn acacia, and those thorns are so wicked that one punctured my truck tire once. 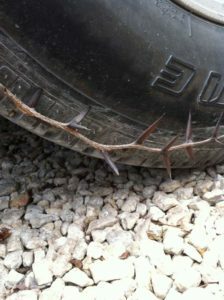 The thorns are hollowed out and occupied by one of a couple of species of ants. The ants are in the genus Pseudomyrmex, and I tried to figure out which species we have back there, but they’re too little and too mean and I gave up. They nest and raise their larvae in the hollow thorns, but providing shelter is not all this tree does for them. It also feeds them. In fact, it feeds them carefully and generously, and with a diet tailored to their needs. There are little nubs at the bases of the leaves called extrafloral nectaries which exude a sweet nectar and keep the adult ants well fed, but then at the tips of the new leaves there are also little pods called beltian bodies which are rich in protein, and the ants nip those off and feed them to their larvae. What does the tree get out of it? Well, let me put it this way: You are looking at a tree that never has to worry about herbivore attack. And if you’re a gardener you’ll know what a game-changer that is. Just about every other plant in the world is plagued by insects from aphids to grasshoppers to mites to worms to caterpillars, not to mention the larger herbivores like mammals and reptiles…yet here this acacia tree serenely stands—in the middle of a tropical forest where the insect life is grandiose in its proportions—and it’s completely unscathed. 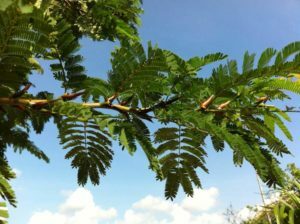 It has even stopped producing the chemical defenses against herbivore attack that other acacias use (alkaloids and cyanogenic glycosides), and it does not even have to toughen its growing leaf tips like other plants do, with the result that it can grow a lot faster and out-compete its neighbors. The ants attack leaves as well as herbivores. Any leaf of a different species that touches an acacia leaf gets quickly clipped away. 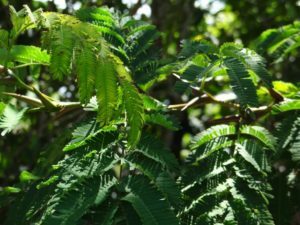 The acacia tree looks like it’s nestled in comfortably against its neighbors, but if you look closer you’ll notice that not a single leaf of a neighboring tree is actually touching an acacia frond anywhere. 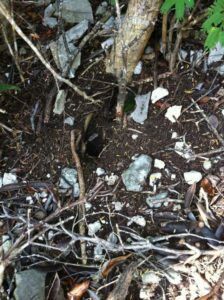 Often the ants even keep the ground clear around the trunk of the tree. I’m not making this up. There are signs of it around Dave and Nancy’s tree. They weed around it, preventing any other plants from getting established and competing for the water and nutrients. This acacia lives a charmed life. It doesn’t have a thing to worry about, not even competition. 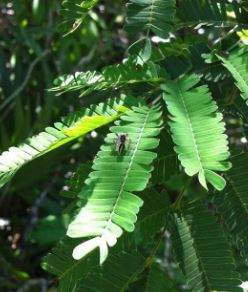 This acacia lives in a patrolled, gated community. 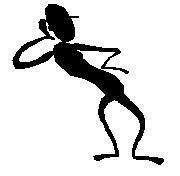 Nothing goes on in that tree without the permission of the ants. All the tree has to do is sit there and grow. 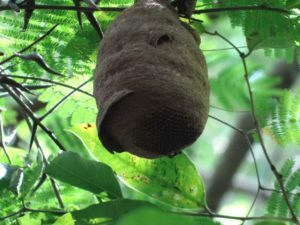 Birds also build nests in hollow-thorn acacias, and love it there for all the same reasons the wasps do, but it is “not yet clear” why the birds do not get attacked. One reason for this “not yet clear” stuff is that hollow thorn acacias have not been well-studied historically. First of all, I can attest that those ants do not like naturalists any better than they like herbivores. But also, back in the day, botanists did all their field work with plant presses, and those thorns can really screw up a good plant press, and on top of that you end up with a plant press full of extremely vindictive ants. They’re not the most pleasant trees to study, and I’m looking forward to moving on to my next article. They did some studies on ant-acacia partnerships in Africa and discovered that if you fence off the acacia to protect it from large herbivores, it scales back its production of nectaries and thorns because it no longer needs the services of the ants. I kid you not. It lays them off. But it sort of backfires, because then the ants have to find another way to make a living, so they go back to farming aphids like their ancestors did, and end up not only allowing these plant-eating aphids in the tree, but promoting and protecting them. Here in Central America there is one creature who has learned to game the system. He’s a small spider, and he’s kind of cute (for a spider). He’s called Bagheera kiplingi, and if you’ve read some Kipling you’re probably chuckling right now. Yes, he was named after the lithe and agile black panther Bagheera in Kipling’s Jungle Book stories, because he’s a member of a family of lithe and agile spiders called jumping spiders (family Salticidae). But he was named back in the late 1800’s and the scientist who named him had only a single dead specimen and no idea what it did for a living, so he missed out on one of the most entertaining ecological stories in spiderdom. 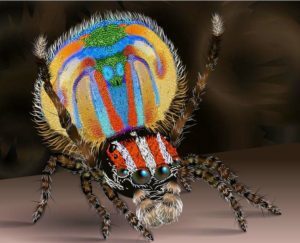 It wasn’t until 2001 that people from the University of Arizona started coming down to the Yucatan and studying this thing in situ, and here’s the scoop: There are 43,678 species of spiders described by science, and this is the only one who is vegetarian. He lives on the nectar from the extrafloral nectaries that are there for the ants. And boy, do the ants hate that. Those ants really want to kill him, but they can’t catch him because he’s a jumping spider. He spends his whole life in that acacia tree surrounded by ants who want to kill him. He brings to mind that iconic line delivered so masterfully by Jack Nicholson, playing a Marine Colonel in A Few Good Men. I can almost see that Nicholson grimace as he says, “I eat breakfast three hundred yards from four thousand Cubans who are trained to kill me.” That’s what it’s like for Bagheera kiplingi, but they can’t lay their mandibles on him because he’s capable of amazing athletic feats. He leaps from thorn to frond to thorn to avoid them, and he spends his down time on old, dried-up parts of the tree that are not patrolled. But every now and then, when an ant is strolling by carrying a larvae, he’ll mug that sucker and steal the larvae and eat it. It’s the only time he eats meat, and I think he only does it for retribution. The jumping spiders in general are also a pretty good yarn, so I’m going to allow myself one of my tangents at this point. There are about five thousand species of them, and the other 4,999 or so all use their athletic skills to ambush prey insects. They are known for having excellent eyesight and high cognitive skills (for a spider). They don’t use muscle contraction in their leaps, they use hydraulic pressure, which is why they don’t have gigantic hind legs like a grasshopper. They have four pairs of eyes, giving them almost 360-degree vision, and the center pair (called the anterior median eyes) have a very narrow field of vision, but they have good depth perception. If you’re an insect and he wants to jump you and eat you, he will turn the front of his body toward you to bring those anterior median eyes to bear, then he’ll round on you with the rear abdomen and legs, and then he’ll creep up, step by step, a lot like your house cat stalking a bird. Finally, the last thing he does before the pounce is attach a strand of silk where he’s standing. They call it a drag line. If he misses or things get messy, he can climb back up to where he was, and it also helps him hold his position when he attacks something bigger than he is. But they can use it even more creatively than that. Sometimes they will attach the drag line in a different location, so that it alters the trajectory of their leap. They can even use this technique to nail an insect who is on an inverted surface. They are known for traversing complicated routes to get in position for an attack, and sometimes the route even takes them out of sight of the prey for a period, which suggests that they have a pretty good memory on board. They’ve been observed descending from one bush and climbing back up a neighboring one to get at a prey insect, and that kind of detour solving is just way more brain power than scientists can explain in a creature this size. And man, you should see their courtship displays. They rival the displays of peacocks and birds of paradise, with shimmering, iridescent blues, reds and yellows, and elaborate dances. They’re really quite beautiful. 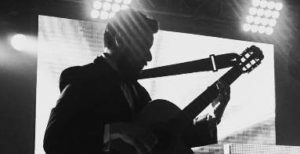 Great article, Randy! I’m sharing it with my adult son who’s a spider nut.